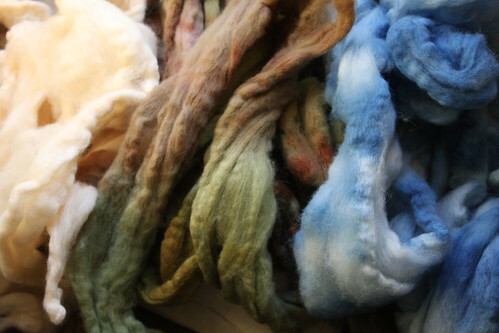 Dye Verse UK: Current WIP…. I am finishing stuff off. Don’t ask me how it got called Mr Bond – something to do with the dice and betting chips he had in his hand when were discussing how cold he was getting in his flat. The flat is VERY draughty despite all of the double-glazing etc. so I took pity upon the poor young man (he had a burpday this week – as he had been telling everyone he was a year younger than he really was [by mistake!] it all came as a bit of a shock as he aged two years in one day!). 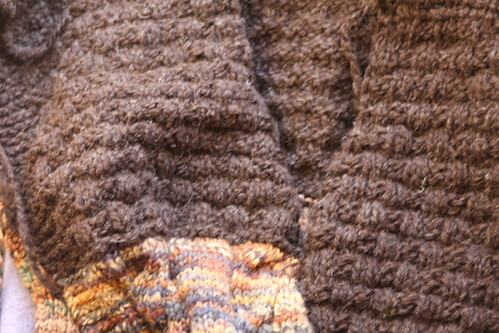 I had to place “expansion joints” – which I am told are crochet detail… which I was chuffed with. Loved the effect of the yarn colourways going in a contrasting direction. 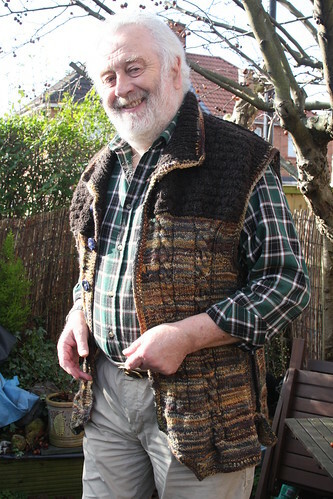 The wool on the back was spun and handyed by me – 64s English, the yarn on the front was a Mandacraft Falkland Isle in the colourway of strata. 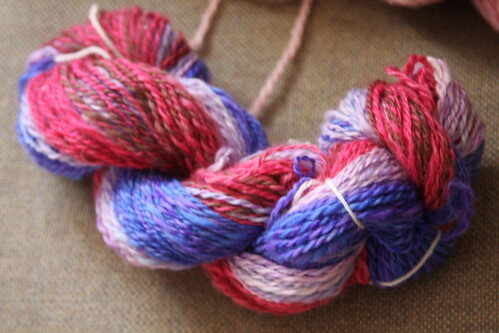 I had originally spun this for something for Toby, but had decided there wasn’t enough. He now has been on a diet, so there would have been…aaargh. 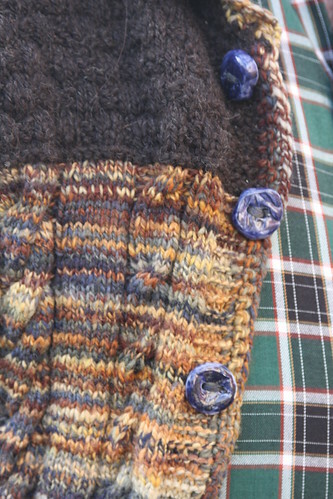 But even with the combination of colours, I didn’t have enough for the chest so this is where the Zwartbles came in. 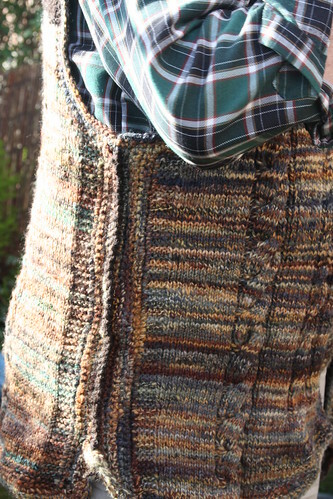 It is a darker brown – almost black – than shown here, and I used a basket weave, then added a collar, with the body wool as embellishment. Even though I say so myself I am very pleased with the effect. So moving on I have sewn up some of the squares for my Barn Raising Quilt. When I can I attend Woolly Thinking in the arcade in Clifton. They have a Knit and Knatter on a Wednesday afternoon, and I find this a perfect time to escape from the house, finish things off and as there is good light (as well as good company) I am able to get on with some of the more delicate finishing off. I finished off plying my Spindle Spun Wool and am thrilled with it – starting to produce the stuff by the metre now whilst I am traveling, so this is adding to my stash. Finally, I finished off the pair of scarves I had been making at Christmas for friends. No picture, as I have to present them first. So… I am now going to warp up my loom with some handspun/hand-dyed and make some large scarves, which could double as wall hangings. I am also getting stuck in with the handspun of my natural dyeing so I can start a tapestry/plain weave picture inspired by the Exe Estuary. This is the Tintern – which was the copper mordanted teal/madder. With the rough sketch – so looking back at the sketch and checking against my colours, I am going to use some of the blue indigo from the first dye baths to highlight and give some depth, and save the paler blue for the sky. I am not really sure how this will turn out, as I don’t want to use traditional tapestry weaving techniques to block in shapes, I want to somehow make this linear as per the sketch and add some interest in the fringes with perhaps some earth beads and sparkles. I don’t know… all work in progress !! 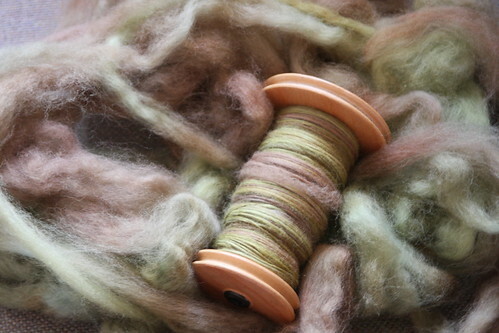 ooohh I like the weskit :o) Did you spin some of the dark yarn in my front room?